Lineage. Constituted as 943 Tactical Dispensary, and activated in the Reserve, on 28 Dec 1962. Organized on 17 Jan 1963. Inactivated on 25 Apr 1969. 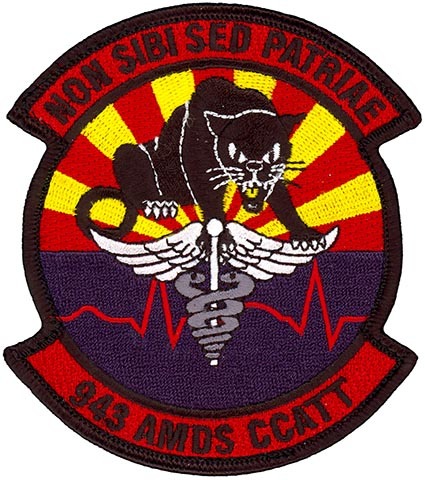 Redesignated as 943 Tactical Clinic on 17 Sep 1986. Activated in the Reserve on 1 Oct 1986. Redesignated as 943 Tactical Hospital on 1 Oct 1989. Inactivated on 30 Jun 1993. Redesignated as 943 Aerospace Medicine Flight on 13 Jan 2005. Activated in the Reserve on 12 Feb 2005. Redesignated as 943 Aerospace Medicine Squadron on 1 Mar 2011. Assignments. 943 Troop Carrier Group, 17 Jan 1963-25 Apr 1969. 943 Tactical Airlift (later, 943 Airlift) Group, 1 Oct 1986-30 Jun 1993. 943 Rescue Group, 12 Feb 2005-. Stations. March AFB, CA, 17 Jan 1963-25 Apr 1969. March AFB, CA, 1 Oct 1986-30 Jun 1993. Davis-Monthan AFB, AZ, 12 Feb 2005-. Decorations. Air Force Outstanding Unit Awards: 1 Jan 1990-31 Dec 1991; [12 Feb]-30 Sep 2005; 1 Oct 2005-30 Sep 2006. Emblem. Approved on 25 Jul 2017.